There is a locate gas station that had to have their in ground fuel tanks removed, due to insurance. The story I was told is their insurance company wouldn't cover their aging tanks. Per small town gossip, there are of course, several versions varying in several level of detail. I'll leave that out. Long story short. The gas station stopped selling gas and started asking for donations to help cover the costs of the new tanks. This had me torn. First off, I wanted to help them out. I want to back the small town business. But then I was kind of put off by them asking for donations for a business expense. Granted it was unplanned, but still a business expense. It seemed weird, but in this GoFundMe day and age, I shouldn't be surprised. Just wondering how long before this is an accepted practice. Local restaurant asking for donations to seal coat their parking lot? Just seems like someone not good at business begging. But then again, I want the small business to succeed. Just because the are "not good at business" doesn't mean I should shrug my shoulders and say "oh well." Maybe helping out a struggling small business that is just starting out will give it a chance to become " good at business" and allow it to prosper. So, like many I gave them a donation. It's the small town thing to do, right? Neighbors helping neighbors. Seemed weird, but whatever. I want them to succeed. Well flash forward from last summer to this winter. 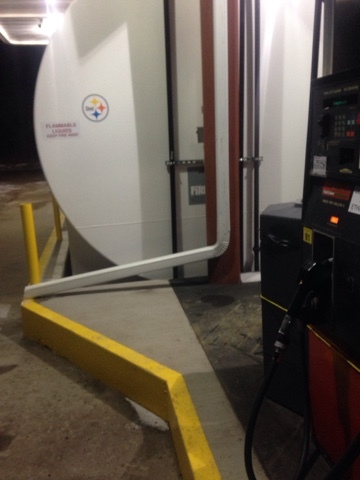 The gas station has brand new above ground fuel storage tanks, and the owners bought a second gas station... so the rumor goes. I know I shouldn't post this until I confirm the purchase is true. But let's just say, I'm not happy at the rumor. Can't afford to upkeep and maintain the store you have, yet a few months later can afford to purchase a second store? Events like this make me more and more unwilling to help others. Which is what really upsets me. If I don't have trust and faith in others, what really do I have?